Competition is intense. In fact, 4 out of 10 market leaders in every industry will be displaced by digital disruption within the next 5 years. This disruption has created a “digital vortex,” with industries inevitably heading toward a “digital center” where anything that can be digitized is digitized. Organizations have to transform to compete in the digital vortex. The entirety of their operations, processes, and business functions needs to be merged into a single, reengineered digital operating model. 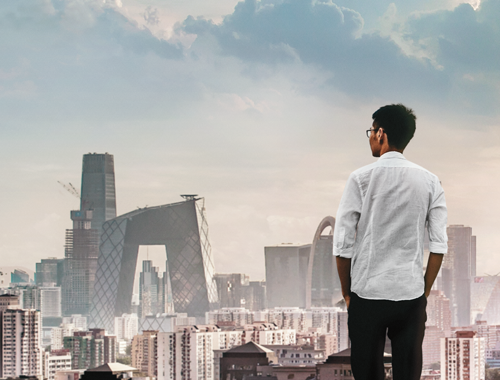 To better understand the impact of cybersecurity on digitization, Cisco conducted an online survey covering 1,014 senior executives in 10 countries. We also performed 11 in-depth interviews with senior executives and cybersecurity experts and developed a financial analysis to help executives place a business value on cybersecurity. Senior business leaders understand the need to digitize products, services, and business models to be competitive and grow their bottom line. 69 percent of executives said digitization is “very important” to their companies’ current growth strategies. 64 percent of executives recognize that cybersecurity is a vital foundation for their digital growth strategies, citing it as a “significant” driver of success for digital products, services, and business models. Lack of a strong cybersecurity strategy can impact a company’s innovation and growth. Nearly 40 percent stated that they had halted mission-critical initiatives due to cybersecurity issues (see illustration). 69 percent of our survey respondents indicated that their organizations are reluctant to innovate in areas such as digital products and services because of the perceived cybersecurity risks. How do executives view cybersecurity? For finance executives, the “ability to enable business growth” accounts for about one-third of the decision criteria weighed when considering cybersecurity investments. Defensive criteria such as threat protection and regulatory compliance account for the remainder. Secure digitizers have higher confidence in the security of key digital capabilities, including big data/analytics, cloud, and the Internet of Things (IoT). They innovate and get product to market faster than their competitors. Cisco has identified 414 digital use cases that will drive $7.6 trillion in Digital Value at Stake over the next decade. Seven defensive use cases (primarily focused on protection of intellectual property and avoidance of security breaches) will deliver less than one-quarter of cybersecurity’s total digital value to private and public sector organizations over the next decade. 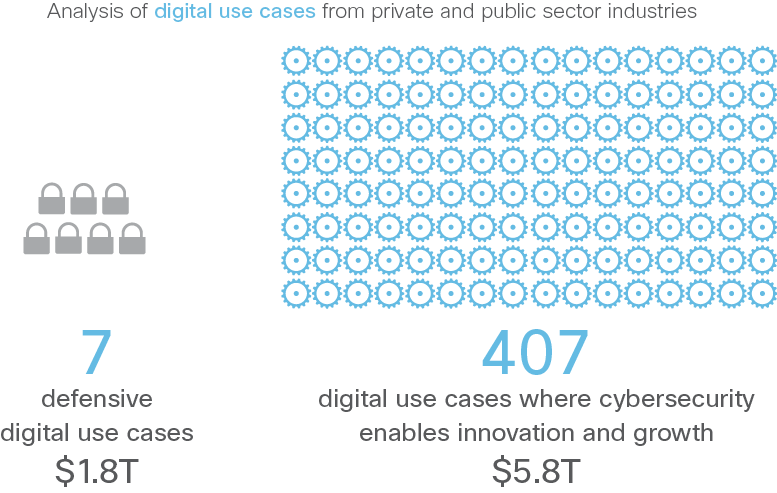 The majority of cybersecurity’s digital value is unlocked through 407 use cases that drive innovation and growth4 (see illustration). Executives understand that digitization gives them the opportunity to improve cybersecurity while making business processes more agile. However, 28 percent of companies are pursuing digitization with urgency, partially because they understand that this can improve their cybersecurity. These secure digitizers are strongly committed to growth through digital business models and offerings, with cybersecurity as a critical foundation. 2. Choose projects with a high opportunity-to-risk ratio, not just a low-risk profile. 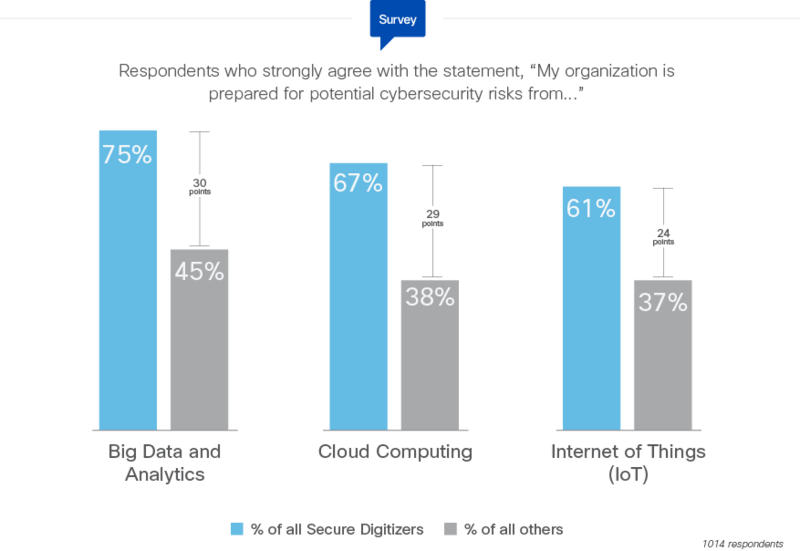 Secure digitizers said they feel prepared to address potential cybersecurity risks in key digital technology areas—analytics, IoT, and cloud computing. As a result, secure digitizers are more confident about incorporating digital technologies into their business (see chart). This allows them to innovate faster and accelerate time to market. 3. Re-engineer digital processes with cybersecurity as the foundation. Secure digitizers identify insecure technologies and the business processes they enable. Then they replace them with new technologies and processes that integrate cybersecurity from the very outset (see chart). 4. Institute cybersecurity expertise at all levels of the company. Secure Digitizers take proactive measures that help them excel in cybersecurity and also boost product development, risk resilience, threat analysis, and response. This requires the inclusion of cybersecurity expertise in many disparate functions of a company. It also necessitates a mind-set that anticipates cyber threats in order to inform other aspects of the company’s strategic planning and operations. To understand how medium- and large-sized firms incorporate cybersecurity into their businesses, we conducted an online survey of 1014 directors, VPs, and C-level executives in October 2015. Over a third (38 percent) of respondents had financial roles and cybersecurity financing influence. The remaining 62 percent of respondents came from a mix of line-of-business domains. They were moderately or very informed of cybersecurity strategy and practices in their companies, but were not in information technology or information security departments. The executives came from the following countries: Australia, Brazil, Canada, China, France, Germany, India, Japan, the United Kingdom, and the United States. Qualitative, hour-long telephone interviews were conducted with 11 experts sourced from the GLG expert network. All were senior executives (current and former) with extensive cybersecurity experience at established companies, in both finance and line-of-business roles. Of them, two were cybersecurity consulting experts. How did we quantify the “upside” of cybersecurity—its direct connection to innovation and growth? As previously mentioned, cybersecurity vulnerabilities and concerns are making many organizations reluctant to pursue digital products and services. In some cases, cybersecurity worries are forcing them to halt mission-critical initiatives entirely. This slowed pace of innovation has a quantifiable cost—the value private and public sector organizations are “leaving on the table” by ceding digital innovation to more nimble competitors. We measured the degree to which these concerns are preventing organizations from realizing the value of more than 400 potential digital use cases over 10 years (2015-2024). Based on the degree of cyber risk associated with each use case, the analysis assumed various degrees of adoption lag—ranging between one and five years. The higher the risk, the longer it takes to address and overcome perception issues. This risk could inhibit growth initiatives that rely on digital capabilities—and slow the pace of innovation and digital transformation. Secure Digitizers are a new market segment identified by Cisco as part of this research study. Market segmentation involves dividing a broad target market into subsets of businesses that have, or are perceived to have, common needs interests, behaviors, and priorities.